A court in Ooty has issued non-bailable arrest warrants against eight Tamil film actors including Suriya Sivakumar, as they failed to appear before the court in connection with a defamation case filed by a senior journalist for their allegedly derogatory speech in 2009. Ooty Judicial Magjstrate Senthilkumar Rajavel issued NBW against Suriya, Sarathkumar, Sathyaraj, Cheran, Vijayakumar, Vivek, Arun Vijay and Sripriya, on Tuesday, after they did not appear before the court for a second consecutive time. It was a no show on May 15 when the case came up for hearing. The case dates back to 2009 when a Tamil daily carried a report that alleged that an actress had raised charges of prostitution on a group of fellow actors and actresses. Following strong protests from the film fraternity, the newspaper had retracted the report and published an apology. However, on October 7, 2009, the Nadigar Sangam organised a protest where these actors allegedly abused journalists. Following this, a senior correspondent, Rozario Mariya Susai, had filed a private complaint with the Ooty Judicial magistrate against them under Section 200 (Examination of complaint by Magistrate) of the Criminal Procedure Code (CrPC) for the offense of sections 499 (defamation) and 500 (punishment for defamation) of Indian Penal Code. As the case came for trial before the Ooty Magistrate court, the actors moved the Madras High Court with a plea to quash the case. This petition was dismissed by the high court in March, after which the trial resumed. When the case came up for hearing on May 15, the actors failed to appear. And it was the same when it came up for hearing again today. 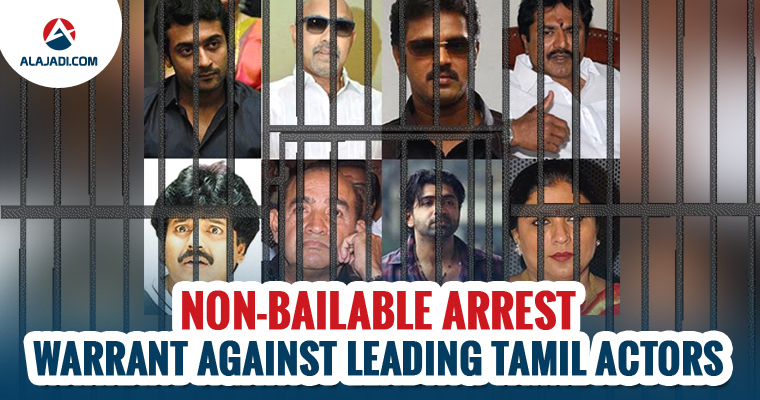 Following this, Judicial Magistrate Senthilkumar Rajavel issued the non-bailable arrest warrant against on Tuesday. The case has been posted to June 17 for the next hearing.